Endoscopic discectomy is a minimally invasive spine procedure, which allows us to treat any problematic disc more safely with great success rate than open spine surgery. Many patients are ambiguous about results of open spine surgery & we think they may be right to some extent. Time and again many research publications have shown open spine surgery for back pain causes more problem in future than helping patients getting rid of them. These problems are direct consequence of destruction caused by open spine surgery while addressing the disease, hence we believe nondestructive advanced approach to spine with latest scientific discovery & technology is best to help you become pain free, while restoring mobility in days. Endoscopic discectomy has proved of value not only for discectomy but also for many other back problems. With this minimally invasive technique all kinds of back & neck pain can be addressed in a very tissue-preserving way. It helps also with chronic back problems that result from stenosis, radiculopathy, sciatica and all kinds of disc herniation. Endoscopic discectomy is a routine procedure performed by Dr Manish Raj at spinomax pain & spine centers. How is procedure carried out? Patient is given mild sedation to relax in operation theatre. 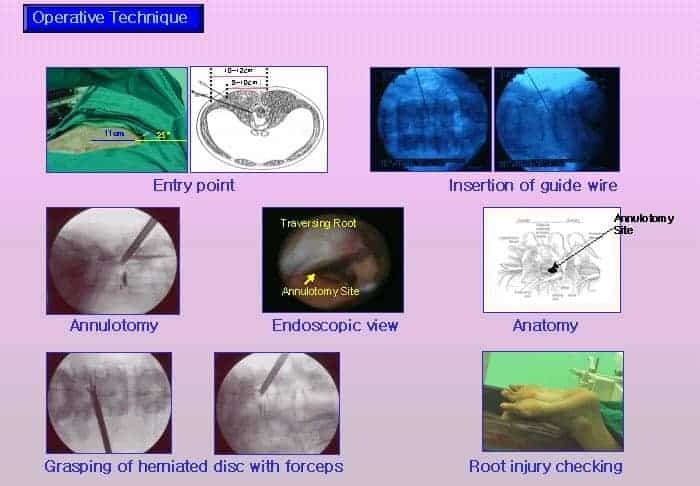 Under local anesthesia and x-ray control the micro instruments are inserted to nearest location of prolapsed disc .Then an optical HD endoscope with working channels will be carefully forwarded up to the disc fragment. 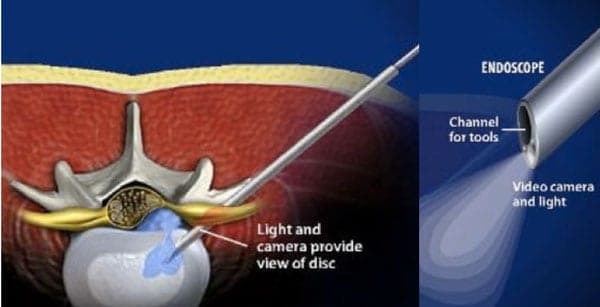 Carefully with help of special instruments problematic disc materials are taken out and with help of radiofrequency cautery broken part of disc is sealed to prevent future prolapse. A single small suture is used to close the entry & Band-Aid is applied. What postoperative care is necessary? Consult Spinomax Pain & spine Center to find out if you are right candidate for Endoscopic Discectomy.